This was the first week of the summer that I’ve been legitimately home all day with H and C. My first week off the kids had drama camp and last week we were in Kansas, so I’ve had more time – and more meals – to prepare. To engage the kids a bit more in the process, I let them pick out the recipes. 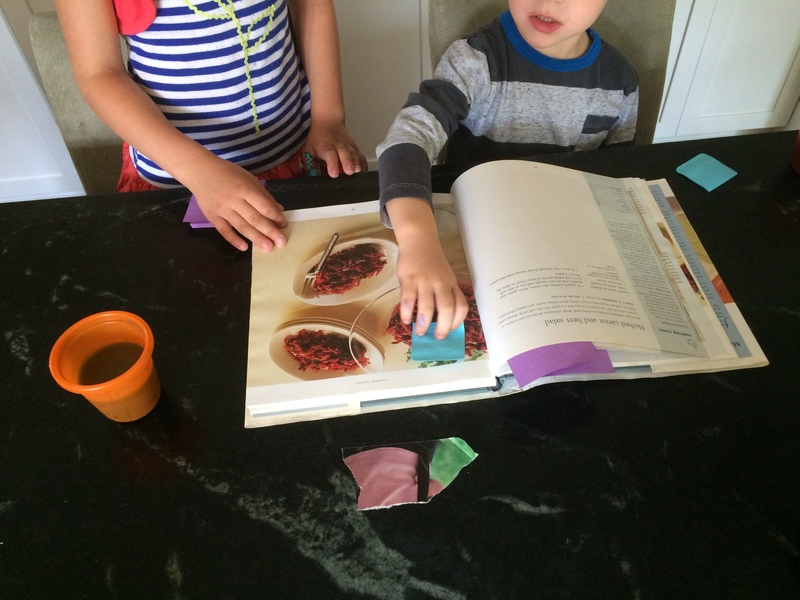 I gave them sticky notes and they marked recipes they wanted in the same way I do each week. It was pretty entertaining to watch them work – and after cooking some of their choices, I have a much greater understanding of how they make selections. It has nothing to do with the actual ingredients – but everything to do with color. Is the food their favorite color? If so – then let’s make it. As we all discovered this week, there were some hits and some definite misses. This past week brought us to the Flint Hills to visit my parents and to give the kids a chance to frolic around the prairie. Other than the heat and remembering what back sweat feels like, it was really great to see the rolling hills, hunt for chalk rocks and agates, and chase fireflies at dusk. Since my mom is my #1 blog reader, I let her pick the cookbook of the week. (Other diligent readers – your chance will come soon! It’s pretty easy – just tell me what you want and I’ll do it. Not a tough crowd here.) I could have guessed the book before we even started the road trip. She loves big, colorful pictures along each recipe (presentation is important!) and likes healthy cookbooks on her shelf. She’s nostalgic, so I knew she’d pick either a cookbook that I gave her or one we both have. Of course – she did both! The New Mayo Clinic Cookbook. I picked up this one for myself when I was working at Williams-Sonoma and I couldn’t walk past the cookbook shelf without taking something home. I knew my mom would love it, so surprise! It’s her christmas present. I may not be the most creative gift giver, but I know what works. My parents live in the country about 25 minutes from town, so there is generally only one trip to the grocery store per week, and the rest we forage from the prairie. Don’t be too impressed – my dad maintains an extensive garden and my brothers have been growing potted herbs since the early 2000s. My mom knew the cookbook, but she wanted me to pick the recipes, so she just picked up a variety of ingredients that would work for most things. Monday night I grabbed the stickies and picked out the recipes that looked interesting and then I started comparing the ingredient lists. So – this is what we came up with! I’m starting my 99 Cookbooks project with one of my first cookbook purchases – Moosewood Restaurant. Low Fat. And low fat for a reason. Published in 1996, I grabbed this one when I lived in Seattle, probably late 2000. I was living in a great rental in Queen Anne with my best friend and brother, and my brother was doing a lot of the cooking for our crew. After a month or two, I realized that his high butter, high cream, high fat diet worked for him, but definitely not for me. I needed to lighten up. My since my bestie is a vegetarian, Moosewood was a great fit. Since I’m forcing my family into this little project, I decided to throw the kids a bone and picked all the recipes from the “Children’s Favorites” list in the reference area. Give me a cookbook with food lists, I’m in love.